Do you ever look at the price of something that you didn't previously know the price of an kind of want to, I don't know, faint and disappear into oblivion because you cannot believe such a thing could cost that insane amount of money? That's how I felt when I found out the price of the Acne Velocite Jacket. You know, the black leather one which monochromatic black shearling lining that your favorite blogger probably owns. Of course, I'm absolutely aware of the price tag of Acne clothing, but was a few seconds away from upchucking my dinner when my eyes glanced over the $2700 price tag. 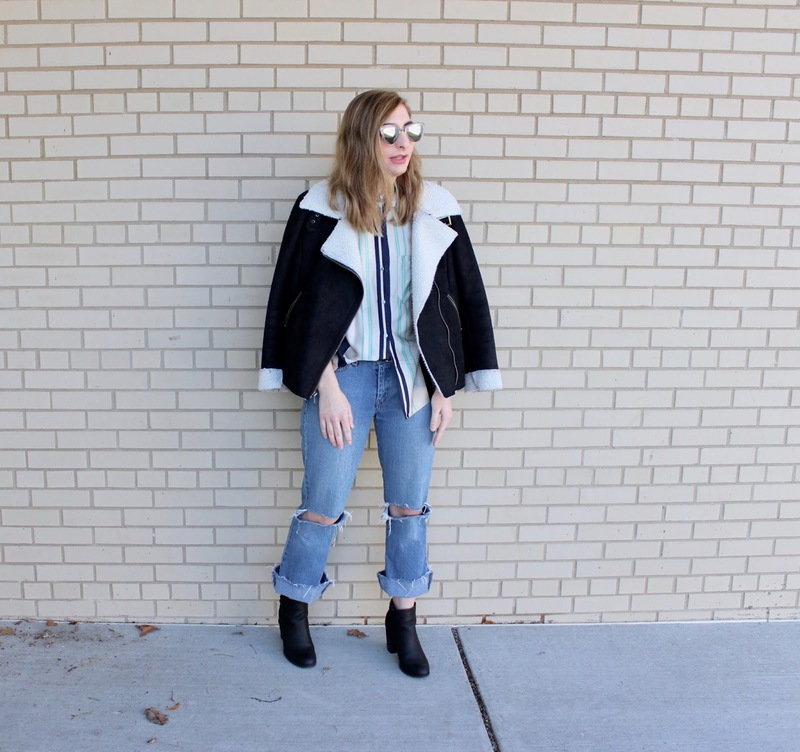 This aviator jacket looks nothing like the Acne jacket, but there are plenty of similarly styled aviator jackets that have almost the exact same look as the Acne jacket at a legitimate fraction of the price, not just a couple of bucks. 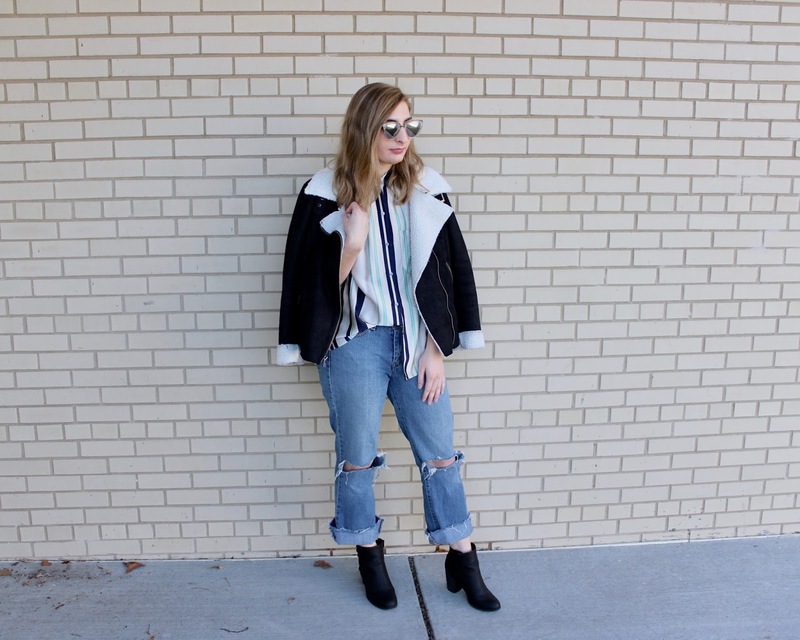 However, this post is making a case for all aviator jackets, whether they have a leather or fabric exterior, black or white lining, and any other variations that can happen in the day and age of an, arguably, over-saturation of clothing brands. I don't think I own a jacket quite as versatile (or affordable) as this one that I got on sale at Target last winter. I'd been wanting an aviator style jacket for quite some time, but was also in a period of my life where I decided that I hate hated and they weren't my thing (fast forward to now where I have what my mom would say it too many jackets) so the idea of actually buying one was absurd. Then, I saw this one, asked my mom if it could be a birthday or Christmas present and immediately bought it when she agreed. And let me tell you, this jacket is an outfit lifesaver. While I might not be on a plane expedition to circumnavigate the globe, this jacket does take me places...you know what, after that joke I think I'm just going to have to cancel myself. I could edit it out, but honestly, it's vital to understand how completely unfunny I am 95% of the time. Anyways, this jacket goes with practically every outfit I could want it to coordinate with. Plain black turtleneck tucked into a pair of skinny jeans (#tbt to skinny jeans, am I right? )(side-note: there was a time where I said I would never wear anything but skinny jeans and now I dread having to wear them, if I ever do)? Sure thing. A chunkier sweater tucked into a mini skirt? Layer this baby right over it. I've worn it over dresses, skirts, jumpers, jeans and sweaters, even over this silk blouse and ripped jeans combination. Truly, it can go with whatever you want it to go with. Plus, you'll always know that you're going to be warm. Practical and fashionable? I'm here for it. 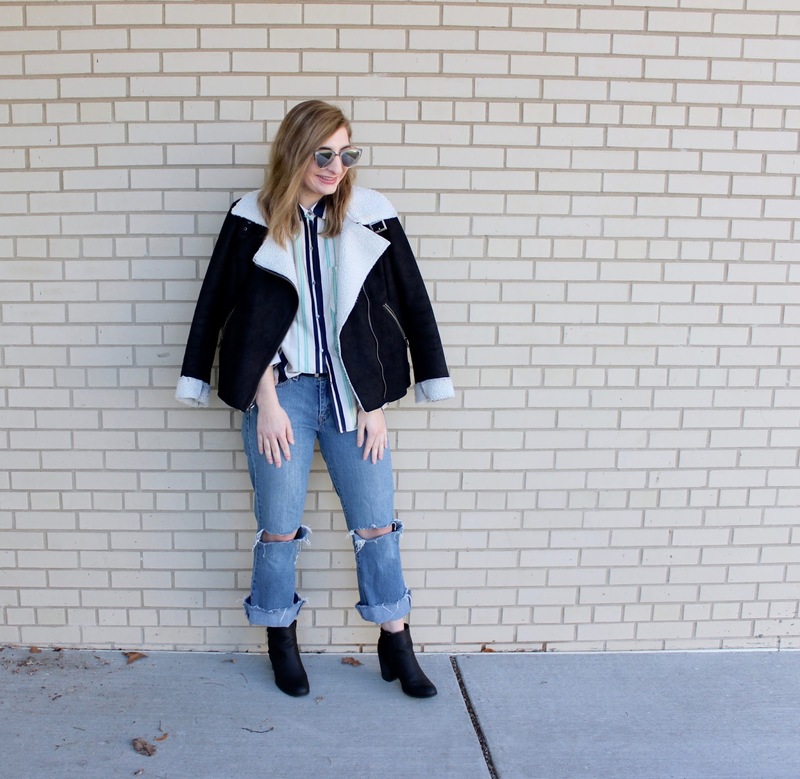 What's your take on the continuing aviator jacket trend?